April is almost here and I am getting excited as I see all the tulips and flowers starting to bloom in our garden here at The Canterbury Events Center! I am getting so excited for the spring and summer months (wedding season is soon upon us! ), so I thought it would be a perfect time for me to show off an amazing wedding we hosted here last April for an equally amazing couple Rob and Lisa! Like many couples these days, they lived out of town so most of the planning was done via email and phone conversations. This can sometimes add an extra challenge, but their wedding proves that with a great team, you can plan a gorgeous wedding and still have fun doing it! I think Lisa says it best… “I wanted to let you know what a wonderful experience we had at Canterbury Place. Planning a wedding from out of state – while fun – was pretty stressful, but you made it easy. Everything was absolutely beautiful and our friends said they have never been to a more fun and stunning wedding. Please tell everyone there thank you for making our day so special!” I had such so much FUN planning with Lisa (plus I have to mention how incredibly organized she was) so hearing her words is like icing on the cake! Speaking of cake, make sure to check out their incredible wedding cake made by Julie Hill with Layers (possibly one of my favorites of all time)…. 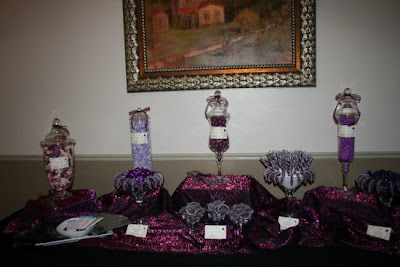 Lisa’s wedding color were an eggplant purple, Raisin, plum and leaf green. I completely love monochromatic color schemes like this, and as you can tell, it turned out amazing! Lisa’s wedding color were an eggplant purple, Raisin, plum and leaf green. I completely love monochromatic color schemes like this, and as you can tell, it turned out amazing! Lisa personalized her bouquet by adding 2 picture charms of her belated mother and step-mother. It truly was beautiful and special! What can I say… this 4 tiered, damask print cake was to die for! I also just want to mention that Rob serves in the military and right after their spring reception, got deployed to Iraq. It’s incredible to me the sacrifices like couples like this make for our country so I want to give an extra big THANK YOU to Rob and Lisa!